Women Culture and Politics is the first Angela Y Davis book I've ever read. For those of you who may not know, Angela Davis is a hugely influential feminist communist activist. She was very active in the 1960s with the Civil Rights movement, fought hard against Ronald Reagan when he was governor of California and when he was president, and continues to serve as a voice of resistance and strength. 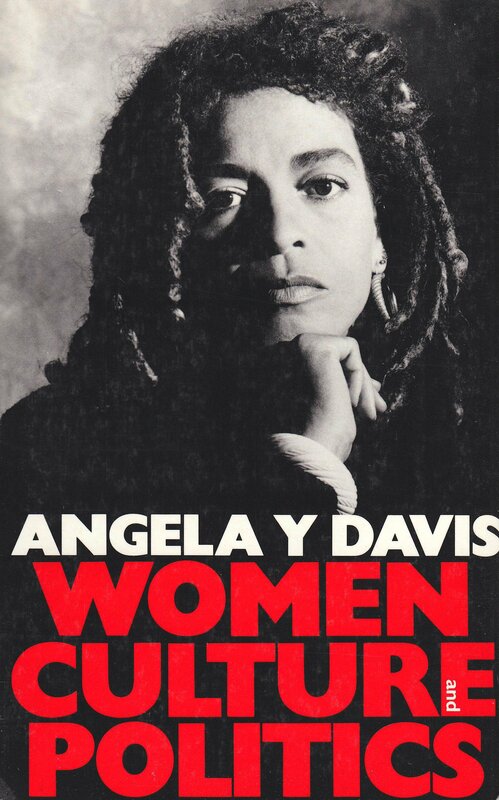 Women Culture and Politics is a collection of Davis' essays and speeches from the 1980s and 1990s. I am not sure if it is the best book to start with, but I think this is mostly due to the format. I admit that my grasp of history from the 1980s and 1990s is not quite as extensive as I would like, and Davis' essays are very much commentary on the times. I wish that there was an introduction to the collection as a whole or to each specific essay so that I had a better grasp and understanding of the context in which she was writing the essay or delivering the speech. That would have helped me a lot to fully understand Davis' points. While some of the context of Davis' points was lost on me, a concerning number of points were still very relevant. I suppose in the grand scheme of things, 30 years is not so long a time in which to make real change in society. But it still feels depressing. One thing Davis talked about in her essays comes up a lot in liberal discussion these days. And that is identity politics. I have been very up and down on identity politics and the impact of identity politics on our election and on the way people describe themselves now. I 100% believe that people should feel comfortable being their truest, best selves, and that they should feel safe enough to be open about who they are. But I also can feel exhausted by the number of identifiers everyone feels the need to use these days. And I am very concerned by the way identity politics has led to white nationalism and supremacy. Davis' approach to this is that everyone should come together. "...we must begin to merge that double legacy in order to create a single continuum, one that solidly represents the aspirations of all women in our society. We must begin to create a revolutionary, multiracial women's movement that seriously addresses the main issues affecting poor and working-class women." This comes up again and again in Davis' writing, this idea that rich, white women seem to fight a completely different battle than working class women of color, and that they often forget to fight for the rights of people who are not as well off as they are. This is still relevant today, and it came up a lot with the Women's March on Washington and it continues to come up with women's rights now when we talk about Planned Parenthood (which we seem to talk about all the time). It continues now as people obsess over the rural white vote. I feel like there must be a way to talk about the issues in ways that are less divisive but that doesn't make people feel left behind. But do we all just jump too quickly now to take offense, to say, "What about me? You mentioned everyone's suffering but mine!" And instead of giving a person the opportunity to go back and consider and grow, we assume the worst and shame the person and then the person gets so nervous about saying anything wrong, but doesn't actually change his/her inner thoughts. Just hides them. And then we are where we are. There is a LOT in this book that is amazing. I folded so many pages down to note down quotes. It would be too much for me to share them all with you, so I recommend that instead, you just read the book and feel all the feels and become a Davis fangirl. I plan to read much more by her, and I look forward to the way she will challenge my thinking. I so agree about this part--you put it far better than I've been able to, although I've been trying to articulate it for a while now: "instead of giving a person the opportunity to go back and consider and grow, we assume the worst and shame the person and then the person gets so nervous about saying anything wrong, but doesn't actually change his/her inner thoughts. Just hides them." Yes, exactly. And, to Teresa's point below, I certainly think we should call people out on hatred and intolerance. But the way people jump on any small comment, even if it is made in passing or as a mistake, can be really overwhelming and make someone not want to engage in the conversation at all. I'm seconding Jeanne's agreement. I do think there's value in calling people out, and I'm certainly not going to say people shouldn't express anger when people say offensive things. Of course that's valid! But will that cause people to change, or will it lead them to go silent and underground when they might with time have been open to change? Yes, very fair point. I admit that I'm not open to some arguments at all. For example, I feel very strongly about climate change (which isn't even a feeling, it's a fact) and women's rights. And while I feel strongly, too, about immigration reform and fighting poverty, I don't have the perfect solutions for those figured out - I think that's where discussion would be really beneficial, to hash out the pros and cons of a lot of ideas vs just having one set of ideas that wins or loses based on whoever is loudest or most powerful. You're so good to read this book and others like it. I feel like I am up on politics and the history of many of the issues, but there are still huge gaps in my knowledge.